Trendy CAR T therapy tried on HIV. The hottest trend in cancer therapy today is using CAR-T cells to attack and rid the body of cancer. Technically called chimeric antigen receptors the technology basically provides our own immune system with directions to cancer cells and keys to get inside them and destroy them. A CIRM-funded team at the University of California, Los Angeles, has now tried that same scheme with HIV. 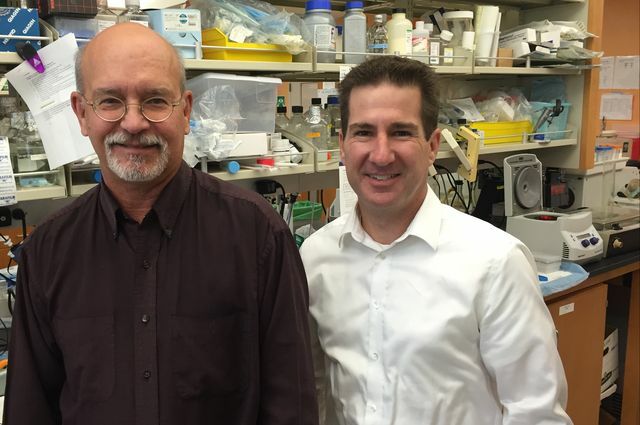 Jerome Zack (left) and Scott Kitchen, found that the technique decreased HIV levels in mice by 80 to 95 percent. Nerves grown on diamonds. Diamonds are so chemically non-reactive our bodies would not recognize them as foreign. But they can also be made to conduct electricity, which could make nerves grown on their surface able to be turned on and off with electrical impulses. When developing cell therapy for several neurologic diseases the ability to control the activity of replacement cells could be critical to success—making new research by a team in Britain and Ireland intriguing, if very preliminary. They doped diamonds with boron to make them able to conduct electricity and then used them as a surface for growing nerve stem cells that could later be turned into nerves. They then succeeded in growing nerves long term on the diamonds. Materials Today wrote a piece explaining the work. Some stem cells talk over “land lines.” Most cellular communication works through chemical signals that get dispatched by one cell and received by others. It turns out that some types of stem cells communicate by sending out tiny nanotubes, sort of a cellular land line. In a classic example of the beauty of young minds in science, prior images of these stem cells had shown the nanotubes, but they had been overlooked until a graduate student asked what they were. Phase 3 melanoma trial explained. When a new therapy gets into its third and final phase of testing it is make or break for the company developing the therapy and for patients who hope it will become broadly available. CIRM recently provided funding to our first phase three clinical trial, one aimed at metastatic melanoma being conducted by Caladrius Biosciences. The CEO of the company, David Mazzo, gave an interview with The New Economy this week that does a nice job of explaining the goal of the therapy and how it is different from other therapies currently used or being developed. The therapy’s main difference is its ability to target the cancer-inducing cells thought to responsible for the spread of the disease.